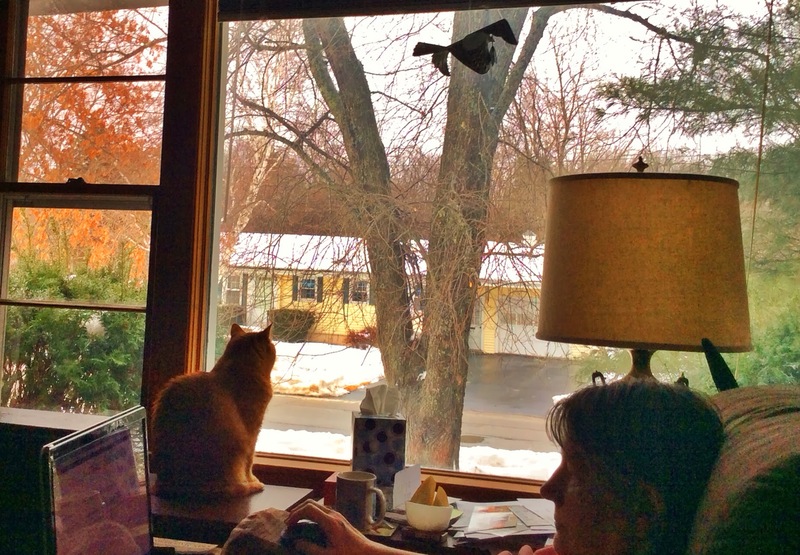 Feverishly drooling with anticipation, local weather prognosticators have been warning us up here in Southern Maine that citizens must stock up with everything needed for a long, long wait for the power to be restored after the "Ice Event of the Year," a storm so horrible that it could "rival the Great Ice Storm of '98!" I guess they have promote fear to get ratings, but really - up here, natives don't listen to such crap. And by the way, just when they predicted that the storm would be "winding down," nothing has been wound up yet. This is the view from our front window, Babe stares at nothing happening as Kathy browses the Internet, since we still have power. I tried to ride yesterday, but the temperature was right at freezing, and the roads were a bit slick. But Christmas Day is supposed to be merry and bright - and cold. I'll try to ride then. 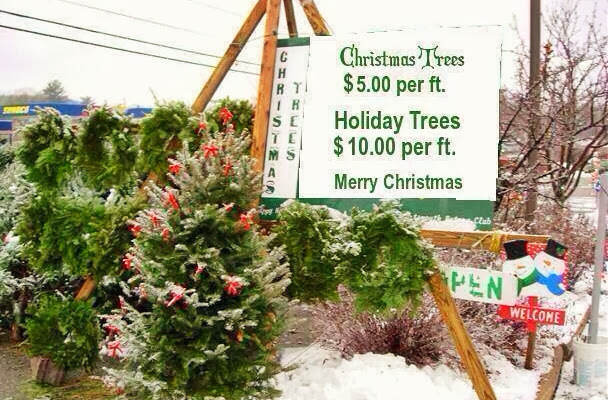 I don't know where this is, but I certainly agree with the tree seller's sign. I still say "Merry Christmas," and some people return the greeting, others reply, "Happy Holiday's," and a few say nothing at all. Do the politically fearfully exchange "holiday presents," feast on a "holiday ham or turkey," and wait until July to take down their "holiday lights?" Merry Christmas and my very best wishes to you and your family Tom! Be careful scooting around in the winter. You might wish to install winter tires (yes such things do exist - check out Steve Williams' blog). Thank you, and a Merry Christmas to you and yours. Actually, I had winter tires last winter, but found that they were far more aggressive than I wanted. While nicely grippy, the tires made the scooter a bit unstable, harder to handle. This winter, I am limiting my riding to the nicest, warmest, most clear-roaded days. Hope the power stays on and you have dry roads for a nice ride. That's a great sign and commentary. Merry Christmas Tom. Hope the weather doesn't interfere with the season's merry making! And a Merry Christmas to you and yours. Unforetunately, we had to cancel our family Christmas Party - while we weren't hit hard, my sister and all her kids got slammed with ice and snow and a lot of yuck. And the roads are as smothered in salt as a million Christmas hams, so I'm off the road for a bit. Absolutely love the sign ... so glad you didn't get iced! Merry Christmas to you and your family. Here's hoping your dry roads continue.